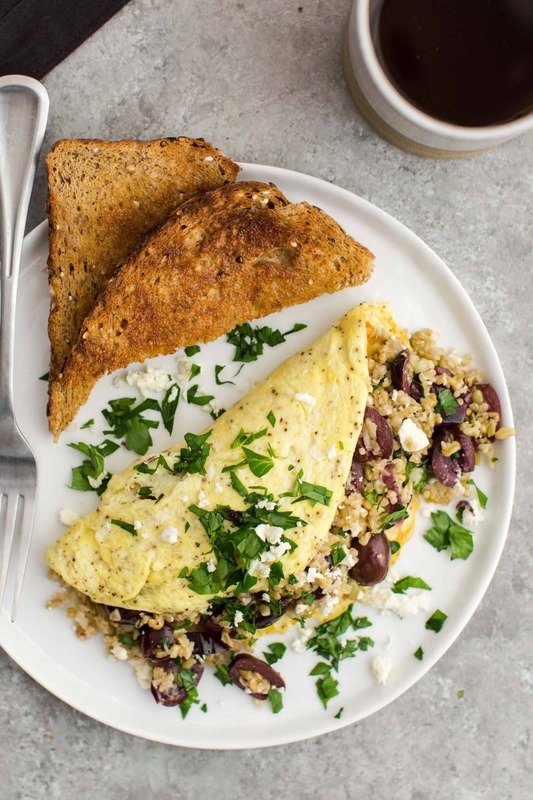 Freekeh Omelette with Olives and Feta | Naturally. One of the best things my family has done is make time for breakfast. Without fail, we make breakfast every morning without having to think about what to make. It’s primarily oatmeal with a few egg dishes mixed in throughout the week. We get variation in fillings and toppings, so we’re never bored. 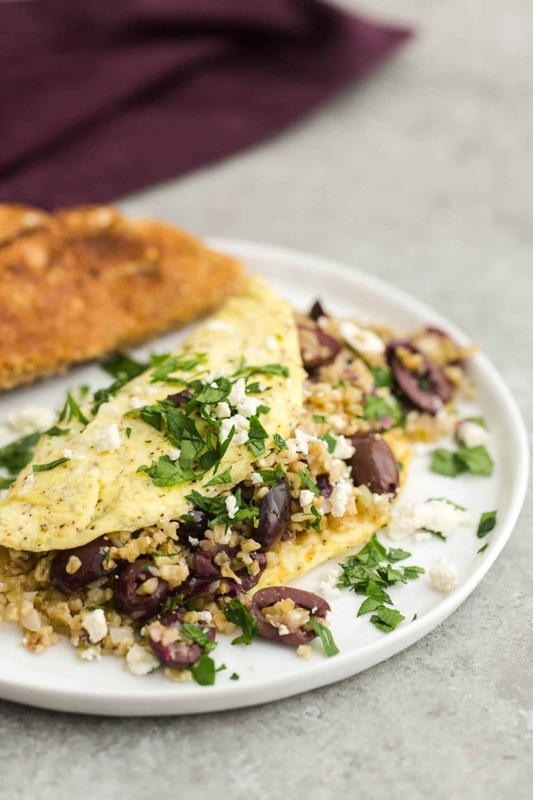 This freekeh omelette is solid example of a weekday egg dish. The freekeh can be cooked ahead of time and the remaining ingredients are no-cook. We always have a jar of pitted kalamata olives stashed in the door of the refrigerator for dishes like this (and pizza). And if you don’t want to bother with an omelette, scrambled eggs are lovely with the freekeh mixture added into the eggs while cooking. In a bowl, combine ingredients for the filling and toss together, set aside. Heat an 8″ skillet over medium-low heat. Add 1 teaspoon olive oil, swirling until the bottom of the pan is covered. Whisk together the eggs, milk, and salt. Pour half the mixture into the hot skillet. As the bottom of the eggs set, lift up the side of the eggs with a spatula and let uncooked eggs run under the cooked eggs. Continue until egg is fairly well set. Carefully flip the omelette over and sprinkle in half the mixture. Turn off heat, fold omelette in half, and allow to sit for 1-2 minutes until cheese warms. Transfer to a plate and repeat with remaining eggs. Sprinkle with parsley and feta before serving. + The feta and olives are fairly salty which leads me to be conservative with the salt amount. There’s a few ways you can go with this filling. 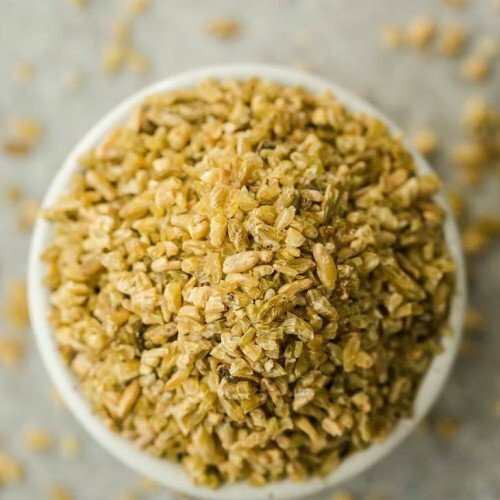 I like freekeh because of the nice flavor it lends to the mixture but can easily change based on what you have already cooked. The filling mixture is also a partial variation of the Mediterranean mix I like to use. If you have any of those items on hand, I recommend adding them to the filling. Grains: Make this gluten-free by using millet or quinoa (still quick cooking). Greens: For extra color and nutrients, sauté some greens (spinach, kale, chard) in a bit of oil until wilted and add to the filling mixture. Olives: If you’re not a fan of olives, swap them out for sun-dried tomatoes or roasted red peppers. I’m rather fascinated by how this wheat grain comes to be. It’s picked green, set on fire to toast, and what remains are the wheat berries that are then cracked. It cooks up in about 20 minutes, has a hint of the toasted flavor, and works so well with many other flavors. It’s one of the newer grains to my kitchen but if you’ve never tried it, I recommend picking up a bag. I bet spinach in this would be lovely! It looks so good! Oh heck yeah! I love olives… And I don’t often get to have them with breakfast! anything with feta and olives, and i’m there! 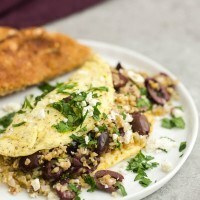 i usually don’t have enough time to turn on the stove for breakfast, but i’m thinking this would be a great lazy weekend lunch or weekend dinner. I love eggs and I love olives. Yum. I’m glad that you explained what freekeh is – I was afraid that I was the only one out of touch. I am definitely going to try this. It looks delicious.